I must start out this entry with a massive thank you to my friend Meagan. 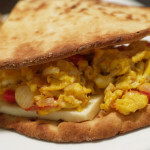 After a lackluster Tofu: Round 1, she suggested how to cook tofu and create a grilled cheese sandwich. I took her advice and and because of her recipe, I created/cooked an awesome grilled cheese. It was delicious, even if my dad disagrees. 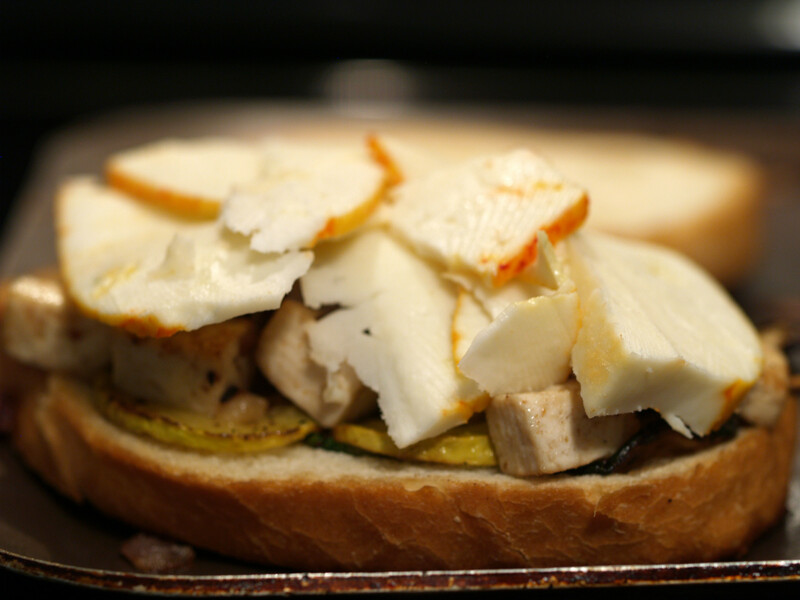 Everything about the sandwich seemed to come together to form a very tasty grilled sandwich. As I have done in the past, I ate as slowly as I could, just so I could enjoy the grilled cheese as much as possible. Muenster cheese was on sale at the local market, so I said, “We haven’t used this cheese yet, why not try it?” So, we did and I am glad that we did. 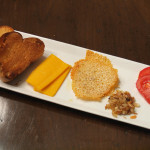 The tasting prior to cooking displayed a crumbly cheese with a thicker texture. It is a mild cheese, but when I tasted it, I definitely experienced some sort of flavor, even if it was muted. The rind, which we did include, had a salty flavor but was still yummy. Overall, I was a big fan of the cheese. I advise you to read Meagan’s comment prior to continuing, just so you can understand where I am coming from and grade me on how well I interpreted her ideas. The prep of this grilled cheese took place in two pans. In the first pan, in olive oil, I sauteed red onion and garlic. After a few minutes, I added in the cumin. 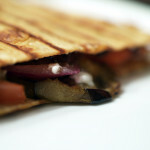 I realize now that I could have added more, but that is a minor change that can easily be adapted in a future cooking. 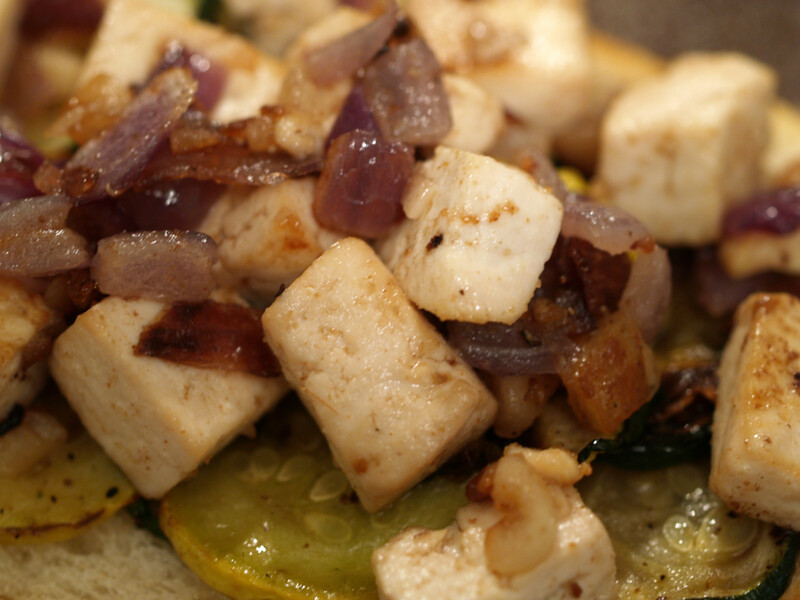 After the onion and garlic were sizzling in the pan, I added a handful of small squares of tofu. I let this saute in the pan until the tofu began to turn a nice brown color, which seemed to be perfect. The sous chef took care of the other pan. 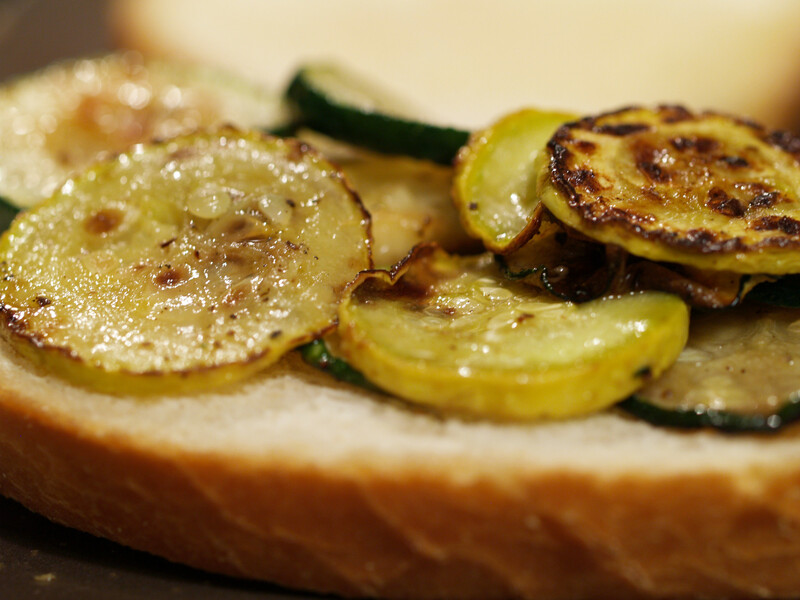 There, she grilled zucchini and squash, seasoned with salt and pepper, in olive oil until they were browning. It really was as simple as that, but definitely was a great addition to the sandwich. Yum! 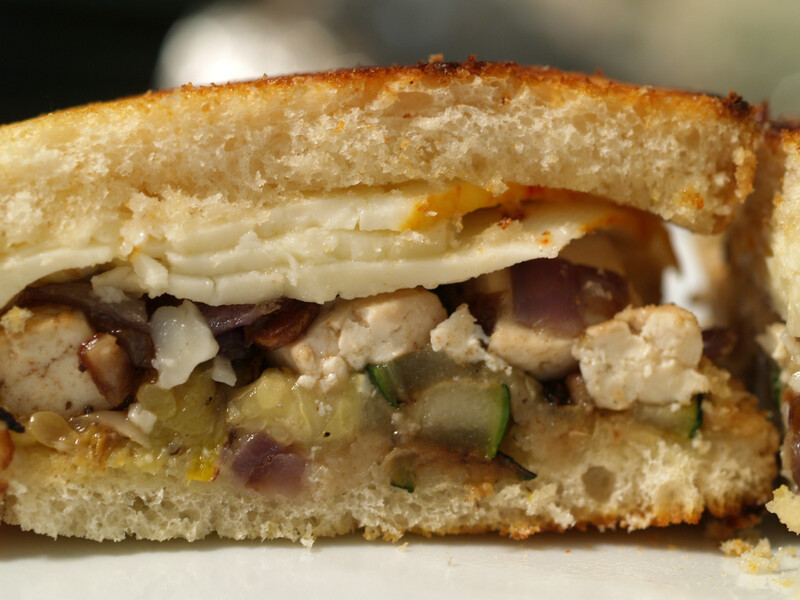 Everything was sandwiched between two slices of grilled sourdough bread. The main reason I loved the grilled cheese was because of the textures. On the outside was a nice crunchy sourdough, while on the inside all the ingredients were soft and somewhat gooey (tofu, cheese, vegetables). You may ask what the other reasons were as to why I loved this sandwich so much, which I did, and oddly enough, I am not sure. I simply think that the flavors/ingredients all combined to create an extraordinary grilled cheese. More in the closing. This evening, I am a man of few words. It must be the sleepiness kicking. 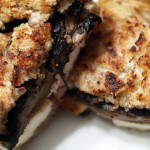 All I can is that I am very appreciative for my friend Meagan making great suggestions on how to kick up my tofu grilled sandwich a notch. 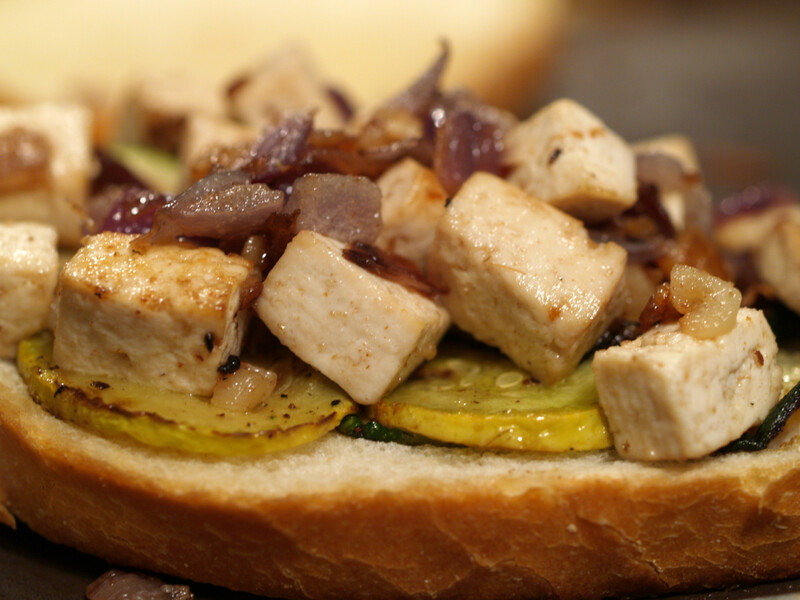 After my less than stellar performance last week, I am glad that I have somewhat tackled the ingredient of tofu with an awesomely tasty sandwich. I can hold my head up high and walk off into the sunset. Goodnight. P.S. 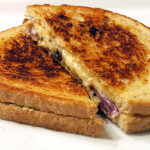 If you were ever to recreate one of my grilled cheese sandwiches, this should be high on your list. 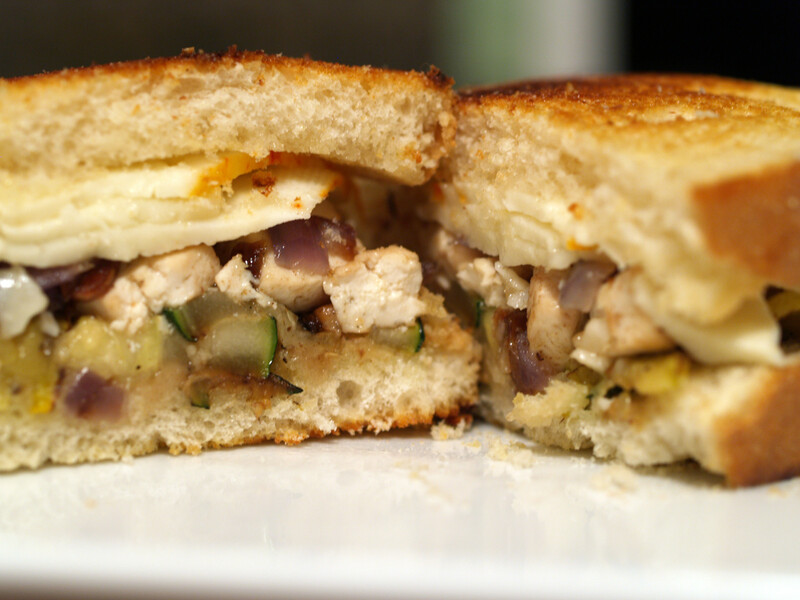 Posted in Grilled Cheese and tagged A, cumin, garlic, grilled, muenster, onions, red onion, sourdough, squash, tofu, yellow squash, zuchini. Awesome! I have my own grilled cheese sandwich! I’m glad it turned out! I’ll have to try it sometime!